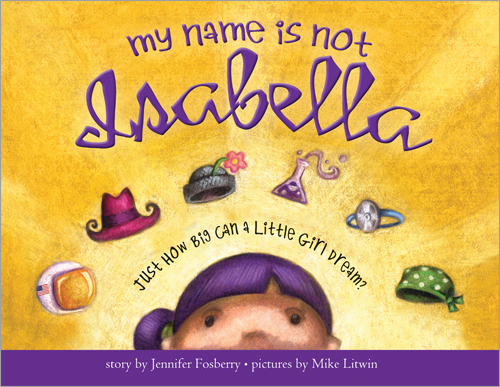 My Name Is Not Isabella by Jennifer Fosberry. Pictures by Mike Litwin. Jabberwocky, 2010. Currently available. Face Value: I wouldn’t have picked up this book if it didn’t have such an intriguing cover. It caught my eye from its perch on the Tempe Public Library’s new picture book shelf. I saw the little girl peeking over the border and had to take a closer look. I liked the style of the artwork, and the girl’s brilliantly purple hair was no small factor in catching my attention. Of all of the elements at play in this cover, it was the subtitle (“Just how big can a little girl dream?”) that most appealed to my feminist sensibilities. Does it break the slate? Yes! It makes substantial Slatebreaking strides in its mere 32 pages. Fosberry introduces some amazing female role models throughout the story, and this book could be the start of many conversations about how women have changed the world. I do have some reservations about the final message of the book, but I’ll get to that in the review. Who would we give it to? Mothers and daughters looking for a new bedtime book. This would be a nice one to read when it’s time to be tucked in, and I could see it easily becoming part of a nightly routine. It’s the Goodnight Moon of feminist picture books! Review: Kids play pretend. It’s one of the most magical and terrific things about being a child. Isabella’s playtime stands out from others, because when she plays pretend, she doesn’t just pick any old imaginary scenario. She pretends to be famous women from throughout history. This is where the book’s catchphrase comes into play. When Isabella’s mom tries to get her attention, Isabella says, “My name is not Isabella! My name is…” and then she’ll fill in with the name of whatever famous lady she’s pretending to be at the moment. We watch Isabella become Sally Ride, Annie Oakley, Rosa Parks, Marie Curie, and Elizabeth Blackwell as she spends her day playing pretend. Fosberry selected an interesting cross section of women to feature in this story. We have scientists, adventurers, and activists in the group. Personally, I would love to see a woman from the realm of arts and literature included in the mix, but that’s just because those are the fields in which I live my life. I do appreciate, however, that this book shows a little girl aspiring to careers in the sciences, because that’s a rare thing to find in girl culture. As I read, I wondered how effectively the references to these famous women would work with the target audience. This is a book aimed at preschool and primary grade readers. However, I didn’t learn about women like Sally, Rosa, Annie, Marie, and Elizabeth until I was well into elementary school. I haven’t had the chance to read this book with a child, but I am curious to know if the famous females are more meaningful for the adult reader of the book than the child. Fosberry includes biographical blurbs for each woman at the back of the book, but the adult reader would have to consciously point out that information in order to start a conversation with the young reader about the women who stimulated Isabella’s imagination. Despite this, I still think it would make a great gift for any young girls in your life, because it might stimulate their interest in famous women throughout history and lead to more reading adventures. Litwin’s artwork is a worthy complement to Fosberry’s text. His drawings smoothly transport the reader from Isabella’s contemporary world to the time periods and contexts that she imagines. I especially loved the whimsy of the drawings. 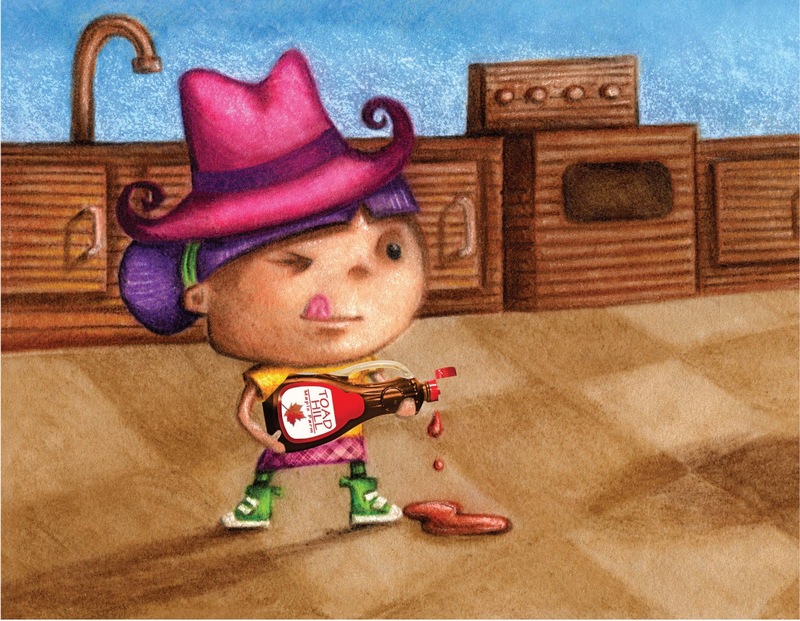 One of my favorite illustrations is the picture in which Isabella pretends to be Annie Oakley, aiming a bottle of maple syrup at her waffles for what is sure to be a messy but delightful shootout. I think it is amazing that Fosberry recognizes how important the role of mother is and equates Isabella’s mom with the Slatebreaking women who are introduced throughout the book. However, I worry that the role of mother is glorified as the best of the roles introduced in the book. I don’t want young readers to think that you have to be a mother to be a successful woman. There are women in this world who are devoted mothers, and that is a tough job that should be valued as much as other forms of work. However, there are also women without children who contribute to the world in significant and memorable ways. Neither way of being a woman is better or worse. You should get to choose the role that you play in this world – and I do think that message is very clear in My Name Is Not Isabella. So as long as the parent and child reading this book together talk about the many ways in which women contribute to society, and the emphasis while reading remains on the fact that there is no one right way to be a woman, this book will do a fantastic job of starting Slatebreaking conversations with very young readers. This entry was posted in Picture Books, Reviews and tagged bedtime stories, famous women, Feminism, motherhood, picture book. Bookmark the permalink. It’s a cute story…especially for my daughter whose name is Isabella. The one thing I can’t get over, though is when Isabella is pretending to be Elizabeth the doctor, the story focuses on the wrong kind of patience. Oh, that’s interesting! I wish I still had the book (I returned it to the library) because I would flip back to that section to read it again. It’s so fun when you can read a bedtime story with your name in it. Your daughter must love that! It’s such a popular name for girls right now – do you think the author selected that name for the character because of its popularity?